by Lisa Irizarry, Newsday Staff Reporter, September 13, 2014. Click here for article in Newsday. It wasn’t until about five years ago that John Walpole Sr. started wondering about the U.S. Army sergeant in a photo on the wall of American Legion Post 1634 in West Babylon. Walpole had an expert restore the picture and said he became more determined to learn about the man in the photo. around, but no one knew anything about him,” Walpole said. Walpole said Saturday that Sardiello has finally received his due recognition. A portion of Bruce Street, outside the post, was given an honorary new name, “Sgt. 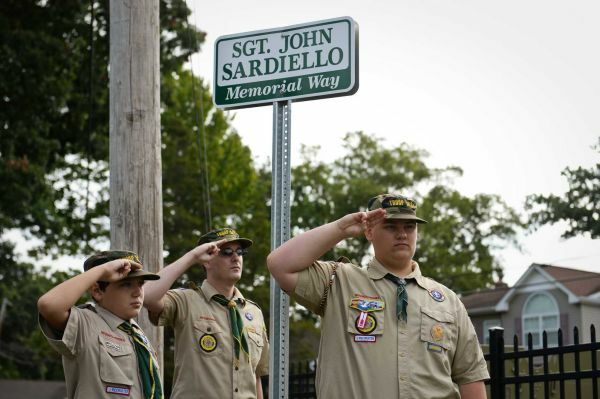 John Sardiello Memorial Way,” and the building was rededicated Saturday in his honor. Walpole and his son had reached out to California-based American military casualty researcher Bill Beigel, who found that Sardiello belonged to the 119th Infantry Regiment and was killed at age 25 in the intense post-D-Day fighting in the vicinity of St. Lo, France. Beigel also learned Sardiello was killed by [bullet wounds] to the head, believed to have been from friendly fire. 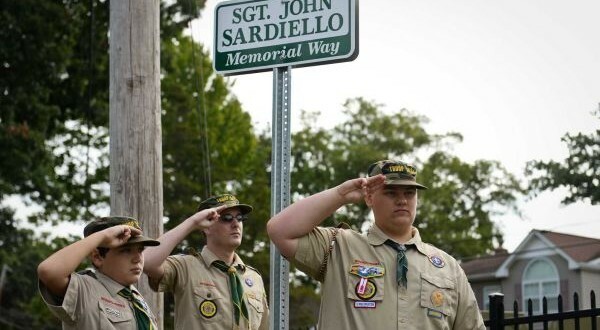 About 40 people attended the ceremony, including members of Sardiello’s family and local and state officials. The family also donated to the post some of Sardiello’s belongings, including a wedding photo with his wife, Lillian, and his Purple Heart. Suffolk County Legis. Kevin McCaffrey (R-Lindenhurst) said that with the expanded terrorism threat, it is important to honor those who fight for our freedom. This version corrects cause of death; reported as “shrapnel wounds” which should be “bullet wounds”.